Life and love should be celebrated! It is a delightful – and all too rare a thing – to be able to bring together all the people you love most. It doesn’t have to be fancy – but it should be meaningful. It should be fun, fantastic, fabulous – and memorable. It’s not the flowers or the food that really matters. It’s you. 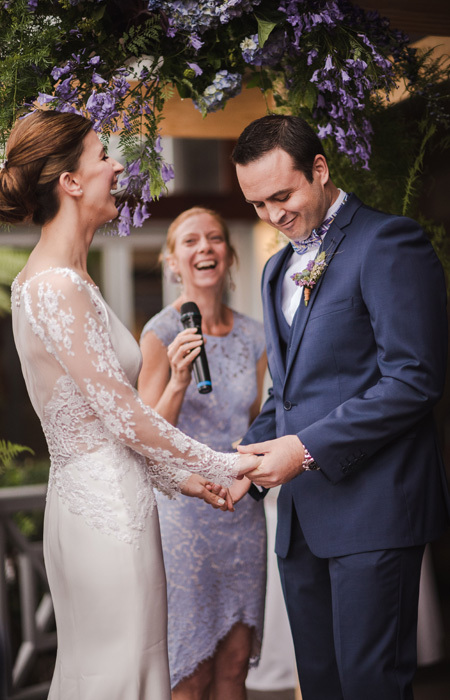 The best weddings and ceremonies, of all kinds – are personal. They are engaging and entertaining as well as romantic and meaningful – to all. They are inclusive, one-of-a-kind bespoke moments. They are never boring, stiff or dull. Actually, if you ask me, there’s no better place for a giggle than a wedding. I’ll write you something amazing – and deliver it like it’s the only wedding I’ll ever do, which in a way, it is (for you). If this sounds like you – then come and talk to me. (I’m nice). My celebrations are for everyone. I do weddings (and funerals, commitments, namings, and renewals) for all ages, all nationalities, all cultures – for all. It’s your happiness that matters – not your gender, your race, your colour or your age. We all deserve to be happy. Nothing makes me happier than skipping away from a ceremony, knowing that I helped to make you really, really happy.